Clematis are popular for their large, colorful flowers. Different varieties bloom at different times throughout the year and should be trimmed only in the season in which they bloom. Clematis are broken out into three groups for pruning purposes: early-flowering, late-flowering and large-flowered cultivars. Early-flowering clematis bloom in April and May, late-flowering varieties bloom from about mid-June into the fall and large-flowered hybrids bloom in mid-June and again in late summer or fall. 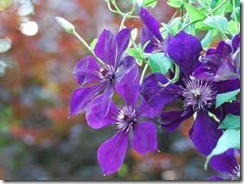 Pruning clematis in a season other than when it is blooming results in fewer flowers. 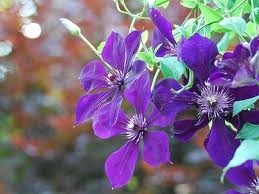 Cut back newly planted clematis vines to the strongest and lowest buds on the vine to produce thicker, faster growth. Prune any early flowering clematis shoots that produced flowers back to within a few inches of the main trunk. Cut the vines immediately after they stop blooming in the summer. Prune each late-flowering vine stem back to a height of 2 to 3 feet above ground in February or March. Alternatively, cut all of the clematis’s stems back to about 1 foot above the ground or to the first pair of strong buds, which may be slightly lower or higher on the stem. Trim weak and dead stems off large-flowered, repeat blooming clematis vines in February or March. Untangle the stems. Prune any overgrown repeat blooming vines in late winter to early spring. You’ll sacrifice the spring blooms, but it will bloom again in the summer as normal. Cut back any large-flowered clematis varieties that bloomed with flowers to the base of older shoots in late spring or early summer, after the first blooming period is over. Cut 1/4 to 1/3 of a large-flowered variety vine’s oldest stems back to 1 foot above the ground annually over several years. Don’t trim early-flowering clematis after the end of July.